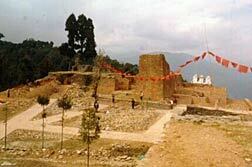 The ruins extended over a considerable area are of second Capital of Sikkim. Tensung Namgyal the second Chogyal of Sikkim and son of Phuntsok Namgyal shifted the capital from Yuksom to Rabdentse in late 17th century AD. 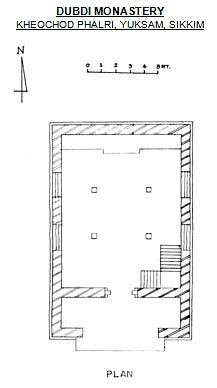 The exposed and restored remains contain royal houses, places of worship, votive stupas etc. 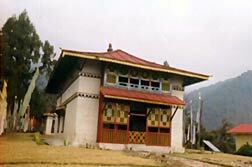 Located on top of a hill on a picturesque surrounding it was the first Monastery established by Gyalwa Lhatsun Chembo during the reign of the first king of Sikkim and was built in the year 1701 AD. The entrance of this Monastery is guarded by four divinities- the Lords of North, South, East and west. It is a double storied stone-built Monastery. 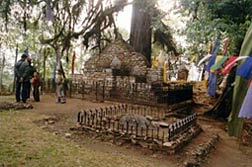 Located in a picturesque surrounding amidst sacred shrines the throne made of stone commemorates the spot where the First Chogyal Phuntshog Namgyal of Sikkim was coronated by the Lamas in the year 1641 AD. It is now a sacred place.